Happy finishers from the Ladies Running Group. The 5k Ready Steady Fun Run is open to male and female runners of all abilities. Rugby’s Ready Steady Fun Run returns on Sunday, May 19, and registration is now open. The annual event is organised by Rugby Round Table in conjunction with Rugby & Northampton Athletics Club. The 5k fun run, which raises funds for worthy local causes, is open to runners of all abilities, male and female, from the age of eight. This popular 5K event was first staged in 2009 as the target event for the inaugural beginners' Ladies Running Group, and has continued to grow in popularity year on year with both male and female runners of all abilities. The fun run is a timed one-lap course starting and finishing at the Rugby's Athletics track, next to the Queen’s Diamond Jubilee Centre. All finishers will receive a medal and post-run goodies and Rugby Physiotherapy will be on hand for a post-race massage and advice on how to relieve aching muscles. Younger children (under 8 years) can also get involved with taster athletics activities provided by Rugby & Northampton Athletics Club, and races on the track after the 5k run. 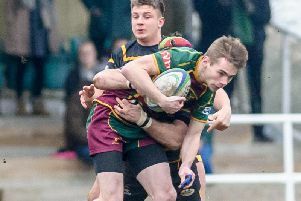 The event is being supported by Brown & Cockerill Lettings, which means that all funds raised will be split between Rugby & Northampton Athletics Club and Rugby Round Table, who in turn distribute the funds to local charities and community causes. Registration details can be found via the Facebook event page or at www.randnac.org. An early bird entry fee of £10 for adults, £5 for under 16s is available until April 19, rising to £12 and £6 after that. On the day entries will be accepted at a cost of £15 for adults and £6 for under 16s. CHEERLEADING: Success in Stoke for Rugby's ROAR!